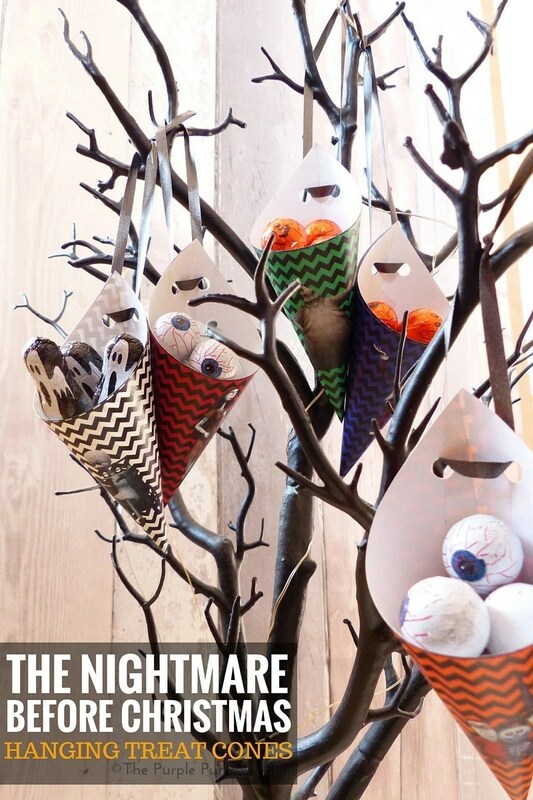 Here is the third free printable in my Halloween party set for Crafty October 2015: Hanging Treat Cones – The Nightmare Before Christmas. There are 12 designs in all, across all of the printables in The Nightmare Before Christmas set with the following characters. For the hanging treat cones, I’ve also included blank ones using the 5 coloured chevron backgrounds. Simply click the text links above, or the images after the instructions, to download a sheet of the character/coloured hanging treat cones that you want. Or you can find them all together in one document here. Each sheet makes two cones of the same character/colour, print off as many as you need onto thick paper. Cut the square out first, then along the diagonal line to make two triangles. To make the cone, flip over to the blank side, with the long straight side to your left, as shown in the photo below. Take the bottom corner, and bend it around to the middle point, lining up the two points, holding in place with your fingers. Then bring the other corner around to the back of the cone, lining up the points again. Secure along this back edge with a strip of tape. Add another smaller piece of tape along the edge inside the cone. It can be a bit confusing the first few times you make these, but once you have the knack you’ll be creating them in no time at all! You could leave them as is, or, to hang them up, punch two holes as shown, and thread some ribbon through. Knot to create a loop. Download all the printable hanging treat cones here, or click the images below to download individual characters/colours. They’re so cute! I was obsessed with Nightmare Before Christmas and I’d play it on loop every Halloween party I hosted! Definitely a halloween movie! Awesome!!!!! I do agree it is more Halloween than Christmas – but having seen it at both times of the year, I think it fits… just :D All hail the Pumpkin King! !